Way down on your wedding to-do list (like, way down there… keep looking, keep looking) is the task “purchase wedding rings”. 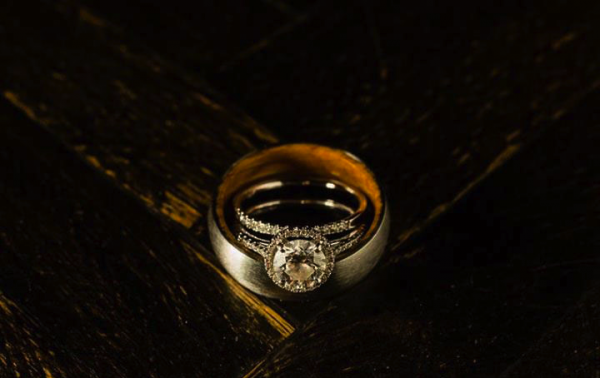 At Samuelson’s Diamonds, we like to remind our future brides and grooms early on of the importance of researching and selecting wedding bands that are perfect for each of you. After all, you’ll be wearing them everyday … for the rest of your life. We think careful consideration should be made on this wedding detail, but find many couples underestimate how many options there are for wedding bands. Have no fear, we’ve broken down the types of wedding band options out there for both “him” and “her” to give you more insight into which style might be best for you. Ladies, there is plenty to consider when selecting your wedding band. 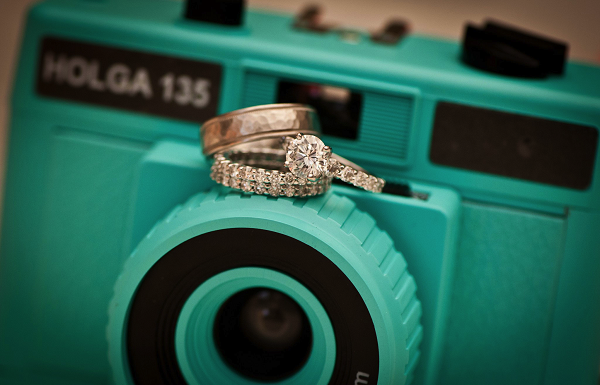 Since your wedding band will sit under your engagement ring you’ll want to keep in mind how they will look together. Do you want a perfect match, where both rings have diamonds of the same size and shape or a unique combination? Once you’ve answered that question, then you’ll be able to decide if you’d prefer a diamond wedding band, a wedding band with gemstones, or just a classic platinum or gold band. If you decide to go with a diamond wedding band, be sure to select a setting with your day-to-day activities in mind. A channel setting protects diamonds from abrasions and offers a smoother look, while a prong setting allows more light into the diamond for maximum brilliance, but will require you to be extra careful in your daily activities. Adding some color to your wedding band can be a beautiful complement to your engagement ring. Keep in mind many gemstones are durable for everyday wear, yet other gemstones may require special care. Be sure to research the durability of the gemstones you’re considering. If you’re a traditional gal, and don’t want to worry about losing diamonds or chipping gemstones then a classic wedding band might be for you. Both platinum and gold wedding band options are durable and sure to last a lifetime with little equired. The good news is that there is a wide variety of styles that grooms can choose from for their wedding band. The downside is that men tend to encounter more scenarios (work, sports, etc.) that could potentially damage his ring. Consider lifestyle when selecting a wedding band for him. If everyday activities create a potential for the ring to be damaged men may want to consider removing their rings during these times. While that seems like the best option, let’s be honest – many brides want their husband to wear that ring at all times, so consider durability during your search. It’s important to remember that lower-karat gold is actually more durable than higher-karat gold because gold is alloyed with stronger metals. Although an 18-karat gold band may be more luxurious, a 14-karat ring may be more practical for a man whose ring is destined for a bit of abuse. You’ll also be able to select between yellow or white gold, which in most cases just comes down to personal preference. While platinum is the most rare and valuable of the precious metals it is a softer metal, so it is easily scratched. This style ring can be heavy so it’s a good idea to try on a platinum ring before committing to it. For couples working with a smaller budget, wedding bands like tungsten or titanium might be a good option. These types of bands are durable and light, but keep in mind – in most cases they can’t be resized. Our superstar sales representative, Cara, says “If you like the look of these alternative metals and have more money to spend, there are plenty of gold or platinum options with similar styles and textures.” Check out the one in the above photo as an example. So now that we’ve shared our “wedding band basics” and have you pumped to pick out yours, it’s time to get out there and shop around. In a perfect world, you’ll walk into a store and they’ll have a ring that’s everything you wanted and more (and it fits perfectly, too! ), but most of you will want to factor in extra time for sizing, engravings and other custom options that may extend the timeline several weeks. I hope I’ve helped get your ideas going and your creative juices flowing!